Excel Door Supplies, the Yorkshire-based supplier of composite doors, has reported solid business growth throughout its seven years of trading. With recent investment to the tune of £100,000 in new CNC router equipment, the company is also planning to open a distribution depot in the Midlands. Working in close partnership with ERA, the security expert, Excel Door Supplies says it has built up a loyal customer base over the past seven years with installers and homeowners throughout Yorkshire. Utilising ERA’s comprehensive range of door and window security, including the new SureFire multi-point lock and the Invincible Cylinder, Door Handles and Hinges, Excel supplies bespoke composite doors to complement any property style. 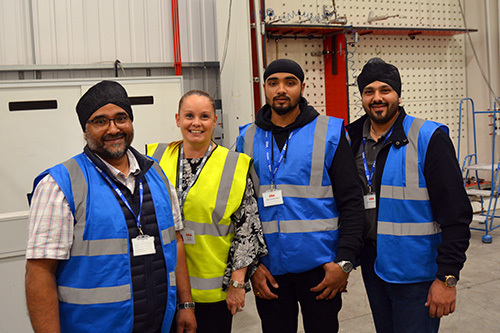 Steven Panesar, Managing Director of Excel Door Supplies says: “It is very valuable when a supplier’s commitment to service matches ours. The team at ERA goes above and beyond the call of duty to provide a great personal and technical service to us. I would go so far as to say that part of the reason for the success of the company is down to our close partnership with ERA. “A good example of this is the way the ERA team of designers and technicians walked us through using the new SureFire lock when it was introduced. In addition, we’re now known throughout Yorkshire as the company specialising in the Invincible Cylinder, which is highly regarded for its strength and solidity. “Our customers understand the importance of having hardware that’s truly suited in order to create a properly co-ordinated look, and that’s something we can really rely on with ERA. We’re looking forward to the next twelve months, and are keeping a close eye on new product developments from our partner.” For further information on ERA’s wide range of security products, including its innovative smart home security suite, visit www.eraeverywhere.com or contact the sales team on 01922 490 000 or by emailing info@eraeverywhere.com. For more information on Excel Door Supplies visit www.excelcompositedoors.co.uk.